Note: An edited version of this blog appeared in the Calgary Herald's, Condo Living section on March 22 and 29, 2014. When I tell people I went to Boise, Idaho for a holiday their immediate question is, “What took you to Boise?” Our immediate answer is “I’ve always wanted to go to an American University football game and we love small university cities and road trips. So when it came to a fall road trip – Boise it was! We discovered this city of about 210,000 (metro population of 600,000) to have a vibrant downtown that could well be North America’s next urban playground with farmers’ market, arts and craft market, “farm to table” restaurants and wineries. Despite the obvious size difference, I thought it would be fun to compare Boise and Calgary as urban playgrounds. The Boise tailgate party was a sea of blue and orange around the stadium. I'd estimate the crowd at about 10,000 people. Just to the west of downtown Boise lies an old industrial area that has been branded as the Linen District based on the name of its historic Linen Building. The building is currently being used as an art gallery and special events space, much like the Simmons Mattress Factory building was. Made me wonder if perhaps East Village should have been branded as the Mattress District. While Calgary’s Mattress District is currently undergoing a massive multi-billion dollar transformation, Boise’s Linen District is evolving organically with the introduction of secondhand stores, as well as the upscale A’Tavola Marketplace, Big City Coffee, salons, home decor and furniture stores. It is also home to Idaho Mountain Touring (similar to MEC) and The Modern Hotel and Bar - an old motel transformed into a chic hotel and funky bar. Instead of major public art pieces, the Linen District has funky painted utility boxes. Jane Jacobs, the ‘60s community activist, who wrote “Death and Life of Great American Cities” once said “urban renewal should be evolutionary not revolutionary.” It will be interesting to see how in 50 years the Linen District compares to the Mattress District. This is the patio with the fire pits at the Modern Motel and Bar. The historic Linen Building at night. Julia Davis Park is on the edge of their downtown and connects it to their river, as does Prince’s Island Park does in Calgary. This 89-acre park is home to the Boise Art Museum, Idaho Historical Museum, Idaho Black History Museum, Zoo Boise, a rose garden, Gene Harris Band Shell and a lagoon complete with paddle-boats. It is a combination of Prince’s Island, Bowness Park and Olympic Plaza Cultural District. Prince’s Island’s 50 acres is home to Enmax Stage, River Café and ChevronTexaco Learning Pathway. Perhaps if you added in Telus Spark and the Calgary Zoo, Calgary might be on par. Just across the street from Julia Davis Park’s museums is the new main Library! – it is actually spelled with an exclamation point at the end. Turns out that when they opened the new library in 1995, the owner of the local “Flying Pie Pizzaria” thought the simple LIBRARY letters on the side of the building needed some pizzazz, so he approached the City about adding an exclamation point. After some negotiation, he paid $1,500 to have exclamation points added to the signage and now LIBRARY! has incorporated it into its official name. Boise is quirky in a fun way! Boise’s North End is a great neighbourhood to wander around (walking or cycling) enjoying the old homes, going for coffee or lunch or maybe some “window licking.” The area is well known for its early 20th century homes especially Queen Anne architecture. There are several different “chill spots” including the Fort Street Market Place home to the Boise Co-op, the 13th Street strip of bohemian shops and the West State Street market place anchored by Albertson’s grocery store. On Boise’s northwest urban edge is the 11-acre Camelback Park, a perfect site for picnicking, or activities like tennis and volleyball or hiking into the foothills. In 2008, the American Planning Association designated Boise’s North End one of ten great neighborhoods. The Calgary equivalents would be Hillhurst, Sunnyside and Bridgeland with their early 20th century homes, Riley Park (cricket, wading pool, perennial and rock gardens and playground), Kensington Village as well as Edmonton Trail and 1st Ave NE shops and restaurants. One of the many historic homes in Boise's north end. Cafe Vicino is an upscale bistro with the best soups ever. It is part of small mall with the Boise Coop, wine store and cafe. Strolling 13th Street you with find an eclectic collection of restaurants, cafes and shops like this one with some very imaginative art. On the other side of the Boise River, south of downtown sits Boise Sate University (BSU) with its 170 buildings including the 37,000-seat Bronco Stadium and the 12,380-seat Taco Bell Arena. BSU is home to 23,000 students, while Calgary’s south side Beltline is home to 20,000 residents, many of whom are recent university graduates now working downtown. The similarities continue if you include Stampede Park with the Saddledome. While Calgary has the 10 days of Stampede, Boise has six days of game day tailgate parties. If you think dressing up for Stampede is a bit weird, you must experience a Bronco tailgate party. Every Bronco home game is like a Grey Cup celebration. Broncos stadium before the game. It is the only football field with blue turf. Downtown Boise is an interesting place in that it has few major office or condo towers, no department stores and no mega indoor shopping centre. So, what is there you ask? While Calgary’s dense downtown is dominated by mega office towers, shopping centres and corporate hotels, Boise’s downtown is very pedestrian friendly with streets full of locally-owned shops, restaurants, cafes and bistros with just a sprinkling of office buildings, hotels and the majestic Capitol Building. While Calgary spends millions on public art, Boise created its renowned Freak Alley for next to nothing. The approach was basically, take an alley, find a curator to invite some artists to paint murals on the backsides of buildings and voila - an outdoor gallery that can be enjoyed free of charge anytime, any day, by anybody. Both downtowns have created a vibrant pedestrian street, Boise’s is 8th Street, while Calgary’s is 8th Avenue. Both have wide sidewalks and are actively programmed and have become the heart of their downtown. The centrepiece of Boise’s downtown is unquestionably the State Capitol Building completed in 1912 with its magnificent 208-foot dome. The interior is just as inspiring with extensive use of marble from Georgia (red), Alaska (grey), Vermont (green) and Italy (black) for its floors, pillars and staircases. There is also a wonderful collection of statues, murals and art, all accessible for public viewing via a self-guided or guided tours. Calgary has nothing to match this historical gem. Downtown Calgary has nothing to match the Boise’s Capital City Public Market that operates every Saturday from April to December. In prime time 150+ vendors take over six blocks in the middle of downtown, selling their wares to over 15,000 visitors a day. It creates a wonderful festival atmosphere every Saturday nine months of the year. This past year, downtown Calgary lost one of its two art house cinemas (Uptown) leaving only the Globe, which has also been rumoured several times to be closing. Boise, boasts what might be the best little art house cinema in the west. Called The Flicks, it has four movie theatres, a restaurant (that serves up food, great wines and craft beers on tap, inside or on its outdoor patio) and also has an extensive international movie rental room. The Flicks is funky! Street performers on 8th Street add fun and surprise to this pedestrian area. Downtown Boise's Farmers' Market attracts thousands of shoppers and people watchers. The stately capitol building creates an immediate sense of place for the downtown. We were surprised at how easy it was to wander the building and take pictures. 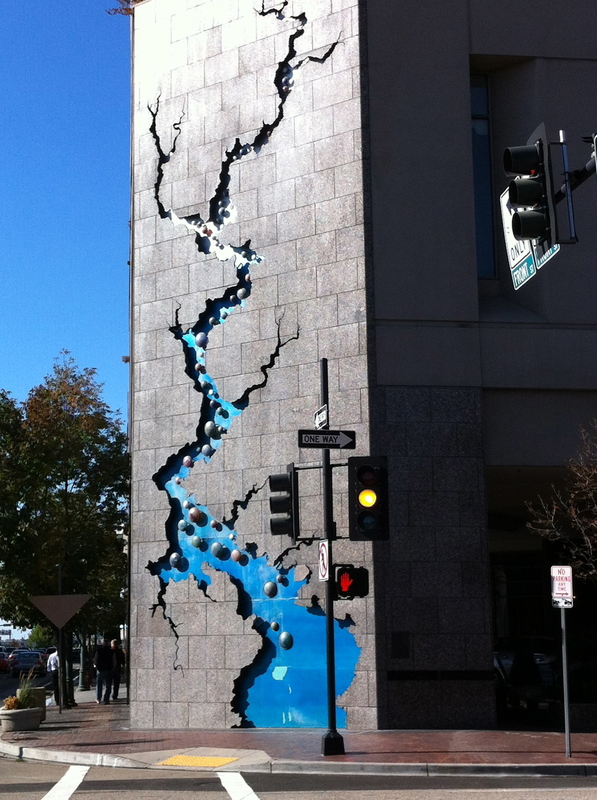 River Sculpture by Alison Sky, is a 50 foot public artwork on the side of high-rise building in downtown Boise. The artwork inspired by the Snake River includes lights and misters to create a more experiential piece of art. 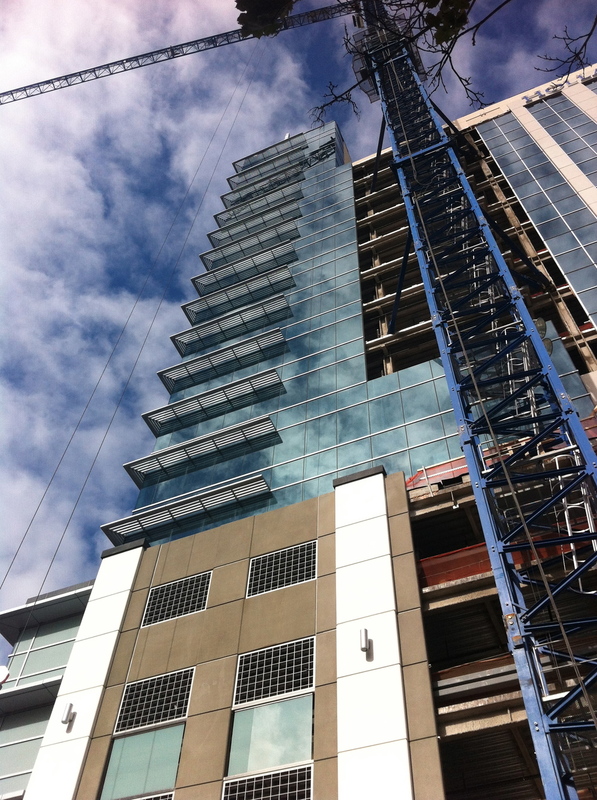 Modern office building under construction in Boise. Calgary is home the Stephen Avenue National Historic District; Boise is home to the Basque Block. Boise has the largest Basque (the region in Spain on the French border, probably best known for the city of Bilbao, where the famous Frank Gehry designed Guggenheim Museum is located) population in North America. While Calgary’s Stephen Avenue Walk is historically significant in Canada, Boise’s Basque Block is unique in the North America and perhaps the world. The one block of Grove St. between Capitol Boulevard and 6th St. includes a Basque museum, market, cultural centre, restaurants and bar. The museum is definitely on the “must do” list for any visitor as it is both a history museum and modern art gallery. It also includes two original Basque boarding houses that you can tour. The Cultural Centre fosters the preservation and promotion of the Basque in Boise and Idaho. Based in the Anduiza building built in 1912, with its original Fronton Court (a huge three-walled court 10 meters high, 30 meters long by and 15 meters wide. It is played with four people (two teams of two) who hit a rubber tennis-size ball with a solid wooden racquet - bit like squash and doubles tennis. Boise is definitely unique! Across the street is the Basque Market, which is home to the biggest Paella pans I have ever seen. They are stored hanging from the ceiling and it takes two people to bring them down. Wednesdays and Fridays at noon it is a “paella frenzy” on their street patio or you can check out the Thursday Paella dinner. There is also the Bar Gernika at the end of the block, which is a “must do.” If you want to hang out with the locals and try some Basque food, beer and wines this is the placed to do it. While Stephen Avenue has lots of restaurants, patios, squash courts, the Glenbow Museum and EPCOR Performing Arts Centre, it lacks the Basque Blocks’ uniqueness. The Fronton Court. Nobody asked me if I wanted to play. Darn! Paella pan is being removed from the ceiling to get ready for the evening feast. A modern work of art in the Basque Museum. Calgary, with its “corporate expense account” restaurants, has been making a name for itself with some of the best new restaurants in Canada. When it comes to eating local, Idaho has one of the most diverse agricultural industries in North America – 25,000 farmers produce over 185 crops. Everyone knows Idaho is a major potato producer in the USA, but did you know that 70% of the commercial trout produced in the US comes from Idaho and that it is a major onion producer? Another popular Boise “farm to table” restaurant, “Fork” is located in a historic bank building on vibrant 8th Street and would fit right in with Calgary’s Stephen Avenue cuisine scene. Add to that the northern Spanish restaurants on the nearby Basque Block, as well as Bardenay, a distillery/restaurant and it’s clear Boise offers a wonderfully diverse cuisine scene. And, yes, Boise also has a vibrant café culture with plenty of street patios. What Boise has that Calgary doesn’t is its own wine region. Just 30 minutes away lies the Snake River Valley wine region where over 40 wineries (many with tasting rooms) can be found. Fork is one of many creative and charming places to dine in downtown Boise. As you might imagine the restaurant Bacon, serves up some very interesting strips of bacon. No plain old Canadian back bacon here! Great sandwiches and quiche also. I have not included any photos of Calgary in this blog as I have many Calgary images in my other blogs. If you'd like to see Calgary images check out these blogs. It is ironic that in December I picked up Stuart McLean’s 1991 book “Welcome Home: Travels in small town Canada” in a Maple Creek SK thrift store and the first story is in fact about his stay in Maple Creek. It was also ironic as 2013 turned out to be “Year of Small Town Travel” in Alberta, Saskatchewan, Manitoba, Montana, Idaho and Washington for Brenda and I. For us, visiting a small towns is mostly just pulling off the highway and taking an hour or so to flaneur the streets, take some pictures, maybe grab a bite or a coffee and chat a bit with one or two locals. McLean, much more strategic, carefully researched his small towns – Maple Creek (Saskatchewan), Dresden (Ontario), St. Jean de Matha (Quebec), Sackville (New Brunswick), Foxwarren (Manitoba), Naksup (British Columbia and Ferryland, (Newfoundland). He chose carefully to ensure that collectively, the towns would reflect that diversity that is Canada’s sense of place. He also went and lived for a couple of weeks in each town, so he could meet the residents and truly understand the psyche of the people and place. This all happened in early ‘90s over 20 years ago. What I loved about the book was the great insights - his and others - that he quotes into understanding the ongoing evolution of our cities and towns, as well as better sense of our collective history as Canadians and North Americans. There are also amazing character sketches for those interested in people. I thought I would share some of these insights with you accompanied by an image from one of the small towns we visited that related to the McLean’s observations. This is a house on our block just a few doors down. Like McLean we live in a Calgary, a big city, however it is composed of over 200 small communities of about 5,000 people, each with their own parks, playgrounds, schools, recreation and community centres. Not that much different than the small towns McLean visited. McLean talks about a Chinese restaurant in his book; this might be it. Had a great soup and grilled cheese. GA writes: "you may want to add the nearby winery, yep I do mean winery. Most of the wine is made from berries and Rhubarb, but they also grow grapes. The wines are certainly drinkable and it is fun to produce for visiting guests. Their wine tastings are professionally done." While I didn't travel to Dresden, I did get to Clarkesdale, Mississippi which is home to the Delta Blues and to Memphis where Martin Luther King Jr. was shot. Both are cities in decline, but with a proud history that they celebrate vigorously. This is the J.W. Cutrer Mansion in Clarkesdale. The Cutrers and their home inspired the character names and settings in several works by playwright Tennessee Williams. This small town is an interesting study in contrasts between the rich and the poor that has existed for decades - it is not something new. Just one of many homes that are slowly peeling away. This is the entrance to Ground Zero Blues Club, one of the most authentic and famous blues bars in the world. The entire inside of the club is like this with people signing their names on every wall, everywhere. It is a work of art. Who knew when I picked up this used book in the spring of 2013 that I would be in the Mojo Man's home turf early in 2014. We discovered the ghost town of Washtucna, while on our way see the off the beaten path Palouse Falls Washington. We don't usually seek out natural wonders, but we were encouraged to do so and in the process we found Washtucna. I did not realize the potlatch culture extended this far south or east, I had always associated it with Pacific Northwest first nations. Every small town has a story to tell. We tried to get into Sonny's but despite the sign it wasn't open. Ted's Garage has become the town's post office. In "Welcome Home" you will read how important the post office was in small towns even in the early '90s. Our equivalent to McLean's Sackville was Moscow, Idaho, also a university town and this was one of our favourite breakfast spots. Check out the Huckleberry Zucchini Bread or the Lemon Poppy Seed french toast. We will be back! The students loved Bucer's Coffee House and Pub....we did too. Great ambience. Every college town needs a quirky bike shop - Paradise Bikes was Moscow's. Yes there is a new clock tower on campus. It also has a great indoor football stadium and one of the world's best climbing wall facilities. Of the 9,000 students, 6,000 live on campus with an 18 to 1 student to teacher ratio. Our dinner at the Sangria Grill may well have been our best meal of 2013. We could show you an image of our plate but the ceiling is way more exciting. Loved the circus dolls. The menu is very interesting e.g. Macadamia coconut halibut mango salsa fried banana rice. Desserts are to die for e.g. sweet potato creme brulee or coconut bread pudding with lucuma ice cream. Yum Yum! Meeting Creek, Alberta was our encounter with the great spirit of the prairie Grain Elevator. It was surreal to just be able to explore this perfectly preserved elevator and station with nobody around. You can't make something like this up. “Left alone in a museum, it doesn’t take much to make a grown man twelve. Wondering vaguely what I will say if someone walks in, I climb into the saddle and lean on the saddle-horn as I read the typed note pinned to the wall. The horse that Tom Thee Persons rode to fame was known as Cylcone.” Who knew this piece of Calgary’s Stampede history is housed in the Nakusp Museum? While we didn't have a saddle to sit on. Brenda has a similar experience when we were exploring Twin Falls, Idaho and she found this pencil dispenser in the library. She had to try it. Not once but twice. It doesn't take much to make a grown women twelve. We also found this display of Red Rose Tea figurines at the library. There were several series but the Canadian Series caught our interest. Who knew the Mongrel was a Canadian animal? These dolls were fastened to posts throughout the city, at first it was cute then just strange. Twin Falls is one of the few places in the world that you can BASE jump without a permit. We had to wait around for a bit but we did see several guys jump. If you look carefully you can see a speck of blue where the bridge shadow meets the steel arch at about two thirds of the way to the top of the image - that is a jumper. “Essentially Albert Lawlor drives the Popemobile up and down highway 10 every day.” Yes the same popemobile Pope John Paul II used when he toured North America in September 1984. One of our best small town experiences of 2013 was when we decided to park our car and walk the streets of Buhl, Idaho. Within seconds I looked over and saw this warehouse with something interesting in a bucket and on the ground. Wandering over, we found the warehouse was full of all kinds of antlers and mounted animal heads that were to be shipped all over the world. We spent over an hour chatting with the guys with the owners. The street art was the head and part of the carcass of an elk that had been shot by the owners son. Their trailer is perhaps the equivalent of the popemobile. Over 150,000 pounds of antlers are collected in this Buhl shop and then sorted and shipped to pet food plants, used for home decor objects etc. All of the antlers are naturally shed, only the mounted heads are from animals that are shot with permits. The Clover Leaf Creamery was another find in Buhl, Idaho. It is a fully operational dairy that uses the old glass bottles and has a wonderful old fashion ice cream parlour. It is amazing what you find if you get off the inter-state highways and take the scenic route. Buhl also had a great thrift store with mid-century artifacts from the community's past. There was also a theatre converted into a Mexican restaurant which told the story of the present economic realities. It is amazing what you find if you get out of the car. Brenda is in her happy place. In “Welcome Home” over and over again you read stories about why people love their small towns - the common denominators being everybody knows everybody, nobody locks their doors, shopkeepers work on credit and lamenting the loss of jobs. Full of everyday stories of everyday people, it is a fun read of what life used to be like whether you lived during that time or not. I loved McLean’s comment when he was reflecting on the changes in the way hockey is played today vs 50 years ago, “somehow the game seemed purer when I was young.” I expect that applies to everything in the game of life.